In this literate and action-packed historical thriller, set during World War II, a plucky code-breaker fights to keep a deadly secret as her Bonnie-and-Clyde past threatens to catch up with her. Thirty-year-old Lena Stillman is living a perfectly respectable life when a shocking newspaper headline calls up her past: it concerns her former lover, charismatic bank robber Bill Bagley. A romantic and charming figure, Lena had tried to forget him by resuming her linguistic studies, which led to her recruitment as a Navy code-breaker intercepting Japanese messages during World War II. But can Lena keep her own secrets? Threatening notes and the appearance of an old diary that recalls her gangster days are poised to upset her new life. Why I want to read it: This actually was published last year by an independent publisher in Canada, but now is being put out by Thomas Dunne. It's the first I have heard about it, and just from the description, I am sure you can guess why I want to read it. World War II. Code breaking. Bonnie and Clyde type past. Secrets. This one has my name written all over it. 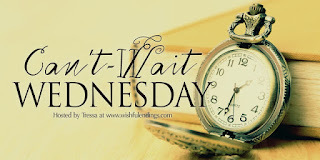 Why I want to read it: This time of year often seems to bring out my love for historical fiction, and how can I resist a novel about three women who survived the Titanic, coming together decades later, and having to face a secret they've kept all that time? You are right. I can't. Do either of these sound like books you might be interested in reading? Both of these looks and sound wonderful! Thanks for linking up! Tressa - I hope they are as good as they sound! Sarah - I agree. I hope they are as good as they look too. I'm a sucker for any kind of code-breaker book, but both of these sound interesting! Just checked and Speakeasy is available on NetGalley. Fingers crossed! I think both of them sound good. I had already seen the Titanic book and noted the beautiful cover and subject matter. Speakeasy is new to me and I want that one too! These are both new to me! I don't read a lot of historical fiction novels but these sound interesting to me, especially On a Cold Dark Sea and how the Titanic plays into it. Sara - I hope they are good. Both of them sound so intriguing! Both of these sound fantastic :) I'm a sucker for good historical fiction. Speakeasy is going on my TBR now. Thank you for sharing! Both of these sound wonderful and I enjoy historical fiction from time to time. Great choices and thanks for sharing! They both look right up your alley. 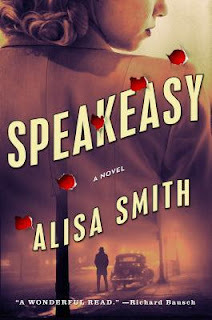 I love the cover of Speakeasy, and the synopsis intrigues me as well. I want to know more about the main character's Bonnie-and-Clyde past. 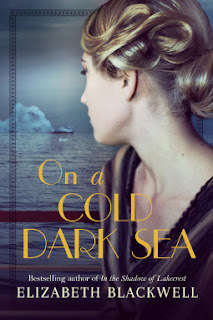 I love anything Titanic related so On a Cold Dark Sea is already on my TBR. Hope you enjoy both! Lauren - I want to know more about their past too! I hope these both will be good. Catherine - Hopefully we will both get to read them (and enjoy them!). Ronyell - I think so too! Hmm, I don't know for sure if this is my cup of tea, but I can't deny how right you are that reuniting these women sounds pretty good! Verushka - Hopefully they will both be good! Oh both of these sound really good. I feel like I've just been in the middle of psychological thrillers so a good historical would be a good change of pace! Iliana - I am ready to settle in with a historical fiction novel! Both of these look great but there is no way I can resist a Titanic mention! Or an old diary with a WWII setting!